This creative personalized Christmas ornament is certain to be treasured for years to come. Customize with a short message or family name and up to six stockings. On top of all of those thoughtful details, this ornament features sparkly red glitter on each stocking, plus each stocking is personalized at the top with any name you choose, up to eight characters. And even more special, this ornament gets further customized by including the right number of stockings to fit your family size – whether your mantle has two stockings hung or more, you can designate this ornament to include up to six stockings, each personalized with the name you choose! 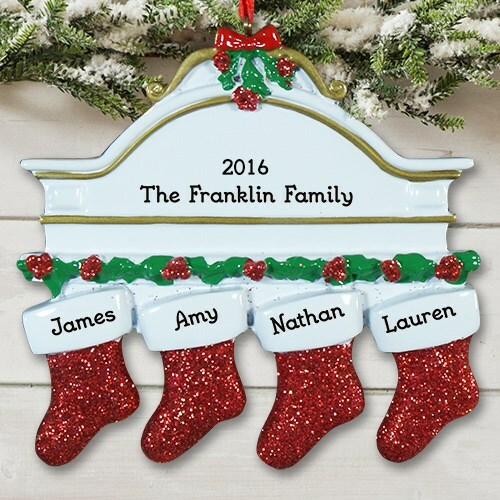 This is such a clever personalized ornament gift and the design is sure to be a hit with your family and as well as others you may have on your Christmas shopping list this year.